The introduction of mainstream solid state storage a few years ago saw a massive adoption within the PC industry, often being regarded as “the best upgrade you can do to your PC”. SSDs are now in almost every computer, helping to speed up tasks multiple-fold compared to a traditional spinning Hard Drive. The flash storage used in Solid State Drives has come along leaps and bounds, but that performance is now being hindered by a bottleneck; that bottleneck arrives in the form of the SATA interface, limiting bandwidth to roughly 550MB/s; M.2 drives are regularly exceeding 3000MB/s which brings about the need for a faster, more focussed interface. NVMe (Non-Volatile-Memory-Express) is the interface used, capable of roughly 4000MB/s on the current PCI-E x4 channel. M.2 drives are now regularly included on most motherboards, with some manufacturers even coming up with genius solutions to add further options; ASUS have implemented a DIMM-slot-style M.2 expansion card onto a few of their high-end motherboards. Throughput increases aren’t the only positive improvement over SATA interfaces, latency is also improved as well as queueing data requests. SATA is capable of only a single queue, with 32 requests within, whereas NVMe can handle 65535 queues with 65536 request in each. Those numbers aren’t a mistake, that’s just what kind of difference the M.2 NVMe interface can make. Samsung were a strong contender within the SATA SSD market, so naturally, we expected to see solid options within the NVMe M.2 form factor. We have been pleasantly surprised so far, with Samsung generally topping most performance charts. Around 18 months ago, the 960 EVO was released, an excellent drive, capable of incredible performance. Today we see the EVOlution of that drive, the 970 EVO. The 970 EVO is available in 250GB, 500GB, 1TB and 2TB capacities, using 3-bit MLC V-VAND and a newly enhanced Phoenix controller. Samsung have also improved their TurboWrite technology, used to improve speeds within many scenarios. The 970 PRO is also launched today, which we will review later in the week. Endurance is also improved over the previous generation, with up to 1,200TBW (TeraBytes of Wear). There’s also the inclusion of Dynamic Thermal Guard, to prevent these densely packed storage solutions from overheating during demanding usage. 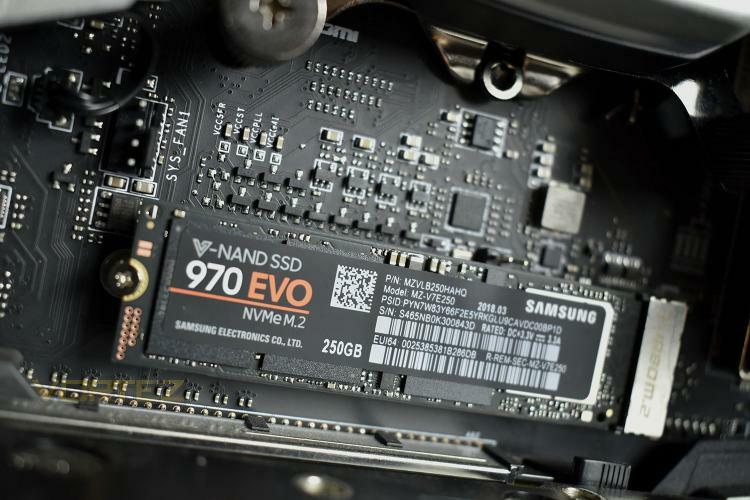 The Samsung SSD 970 EVO is the 2nd generation of Samsung’s 3-bit MLC NVMe SSDs for client PCs. The Samsung 970 EVO is specially designed for tech savvies, gamers and professionals who frequently work on video creation/editing or simulations that require high workloads. Featuring the latest Samsung 3-bit MLC V-NAND technology and a newly enhanced Phoenix controller, the 970 EVO delivers unrivaled next-level performance and exceptional reliability in a small M.2 2280 form factor, offering customers the most advanced Samsung SSD technology currently available for client pcs.